The western side of Lake Garda is hugely popular with Inghams guests and we’re delighted to offer the picturesque town of Maderno. It’s a little town with a number of charming historic buildings just to the north of Gardone with its own beach and a bay surrounded by hotels and restaurants. There’s a busy harbour where you can sit with your cappuccino and imagine owning one of the many yachts! For more energetic moments, the scenic Valle delle Cartiere walk that starts from neighbouring Toscolano is a highlight. A regular bus service runs along the lake towards Riva and Limone in the north and Salò to the south. The recently renovated Hotel Milano is situated right on the promenade of Maderno, only a few steps away from the ferry harbour and a great starting point for visiting the area’s attractions. 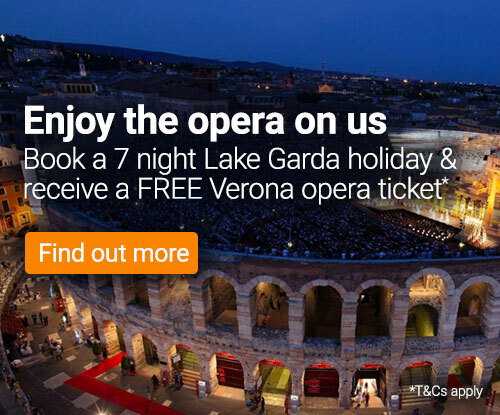 You can combine your 7 night stays in Maderno with 3, 4 or 7 nights in Venice or Verona, or another Lake Garda resort, or in the Dolomites (Selva or Merano).